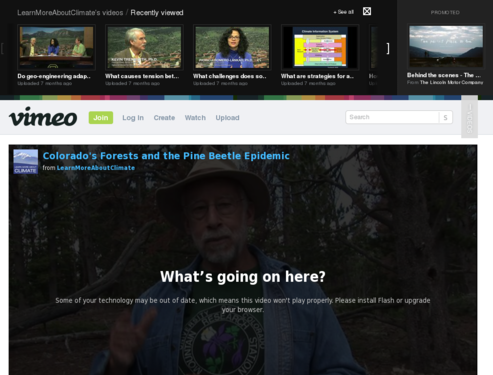 There is additional information available at [link http://learnmoreaboutclimate.colorado.edu/full-scientist-interviews-and-..., including an interview with Prof. Mitton and references. Professor Mitton and researchers explain the connection between the current mountain pine beetle epidemic and climate change in Colorado. They describe how the pine beetle attacks healthy trees and how, in warmer and drier conditions, trees are less able to expel beetles with their moisture-laden resin. More significantly, with a longer warm season, Dr. Mitton's research indicates that pine beetles are able to produce two generations, rather than one, per year. Thus the reproductive potential of the beetle is exponentially greater than it was before. The potential for forest regeneration is also discussed. Drought changes the species composition of the forest and makes it difficult for the regeneration of tree seedlings. This is an exceptionally clear presentation of the issues. The rich details and clear images in this video promote an understanding of how drought conditions consistent with climate change affect both the pine beetle life cycle and the ability of trees to resist infestations. While there is no teacher's guide, there are support materials on the webpage. The video resolution is sufficient for classroom projection.